In two decades of visiting El Calafate, I’ve always written that “the gateway to Parque Nacional Los Glaciares and its spectacular Moreno Glacier…has few points of interest in itself." 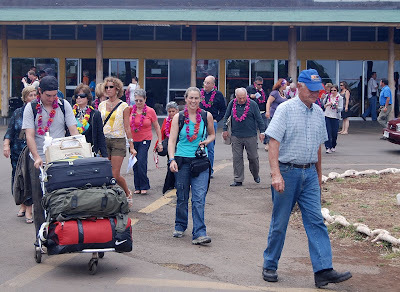 Rather, it's been the town’s critical mass of services (and the lack of them in the park itself) that made it a destination for travelers from around the South American continent and the world. 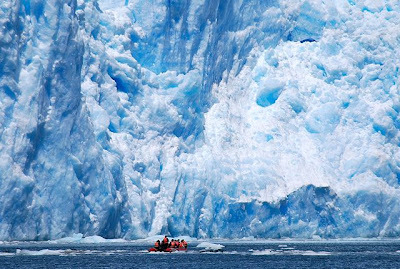 Even if the hotel building boom has slowed over the past couple years, the tourism economy has helped triple Calafate’s permanent from about 6,000 a decade to around 18,000 today. Now, though, the town has that an attraction in its own right. New this month, though not yet officially inaugurated, the Glaciarum is a first-of-its-kind “Museo de Hielo Patagónico,” placing the Patagonian icesheets in natural and historical perspective, in state-of-the-art facilities on a hilltop west of town. Last Tuesday, I was fortunate enough to get a private tour in the company of Glaciarium director Luciano Bernacchi; on February 15th, the anniversary of the date when Patagonian explorer Francisco P. Moreno officially named Lago Argentino, he will host Argentine president Cristina Fernández for the official opening (It’s not often I get priority over high-profile politicians). Within its walls (shaped to mimic the angular blocks of ice on a glacier’s tongue), the Glaciarium offers sophisticated exhibits on the formation of the Southern Patagonian icefields, their original coverage and present extent, and detailed descriptions on individual glaciers on both the Argentine and Chilean sides of the border. 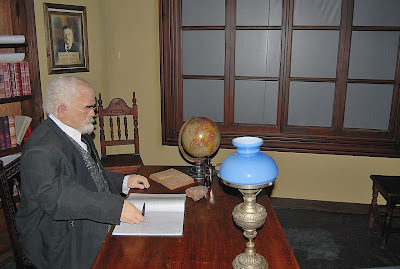 There are also accounts of discovery and research, with special emphasis on “Perito” Moreno - in fact, there’s even a robot of an elderly Moreno at his desk, writing his memoirs with an out-loud narration of his thoughts (Perito means “expert,” an honorific commonly attached to Moreno’s name). Note the photograph of US President Theodore Roosevelt, who toured northern Argentine Patagonia with Moreno, on the back wall. Built with private funds, the museum’s didactic purpose is to promote public consciousness of climate change and environmental deterioration. The consulting glaciologist is Pedro Skvarca of the Instituto Antárctico Argentino; an early mountaineer in the region, he found his life’s calling in the preservation of the massive rivers of ice and the summits that surround them. In addition to the regular exhibits, there is an art space and a 120-seat theater that offers a 3-D tour of the glaciers themselves - certainly worthwhile for those who lack time to visit all of them. The informational panels, and the recorded narrations, are available in both Spanish and English. On a hilltop several km west of town, the Glaciarium is open 9 a.m. - 9 p.m. daily except Monday, when it’s closed. Admission costs US$17.50 pp, US$12.50 for children age six to 12 - making it perhaps Argentina’s most single expensive museum. Still, in a country where government subsidies are a way of life, it’s refreshing to see private sources ponying up with confidence that the public will make it worth their while. 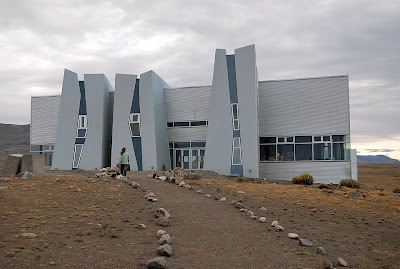 Besides its exhibits, the Glaciarium has a confitería for snacks and sandwiches, a souvenir shop, and, in the near future, it will add a subterranean ice bar. Given its distance from town, it also offers its own hourly shuttles to and from the site (US$6 pp r/t). 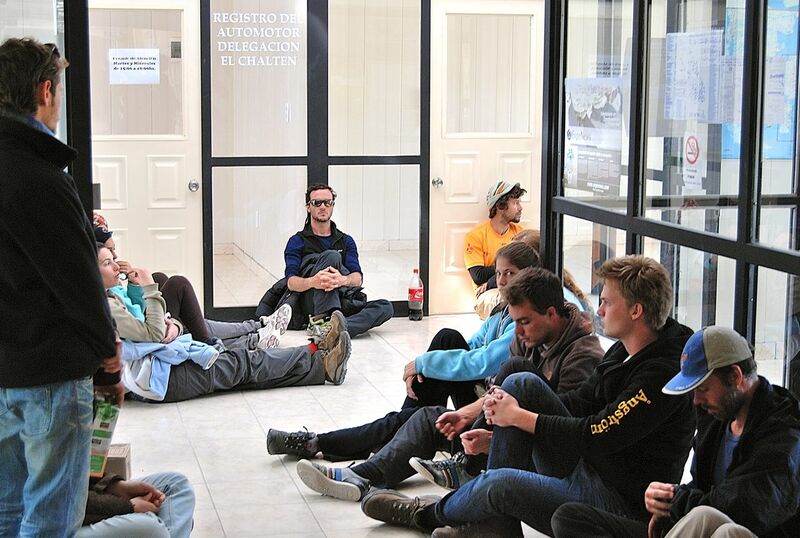 In southernmost Patagonia and Tierra del Fuego, it’s been a disorderly summer, what with the natural gas pricing protests shutting down the Chilean city of Punta Arenas and effectively closing the borders with Argentina for most of a week in mid-January. According to Mercopress Noticias, the Magallanes region’s hotels suffered a 60 percent cancellation rate, with a loss of US$6 million in revenue; at one point there were only 70 people in Torres del Paine (pictured above), a park that averages 3,500 visitors a day at this time of year. Meanwhile, across the border in Argentina’s southwestern Santa Cruz province, visitors are learning to live with lines. 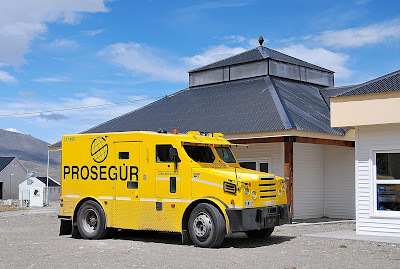 When I arrived in El Chaltén last week, there was no cash in the town’s only ATM but, a couple days later, lines formed when an armored car appeared outside the new bus terminal (site of the ATM) in mid-afternoon. In fact, they sat and waited in vain for hours as nothing happened until later that evening; by the time I went the next morning, lines were shorter and my wait was only a few minutes. Throughout Argentina, the shortage of banknotes has been a problem this summer, but it’s a recurring issue in El Chaltén. That’s because this town of about 1,000 residents gets overrun with Argentine and foreign visitors who come to enjoy its spectacular natural attractions but fail to bring enough cash to pay for their services, putting pressure on the only source in town. 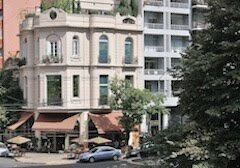 Local merchants are happy to accept US dollars, euros, Chilean pesos and Brazilian reais, at fair exchange rates, but credit card services are still uncommon here. 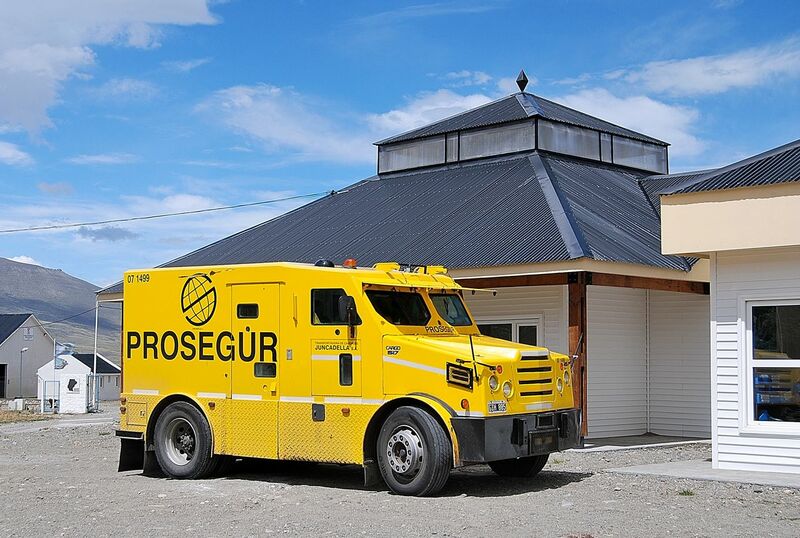 Bills to fill the machine come from the provincial capital Río Gallegos, which is more than 450 km, about a six-hour drive, to the southeast. This is not something on which Banco Santa Cruz places the highest priority. Meanwhile, in El Calafate, the ATM lines are shorter, perhaps because credit cards are more widely accepted, but the two service stations have experienced gasoline shortages because of heavy demand - unlike end-of-the-road El Chaltén, where walking is the principal means of getting out of town and into the backcountry, sights such as the Moreno Glacier (pictured above )are more spread out and require motorized transportation. 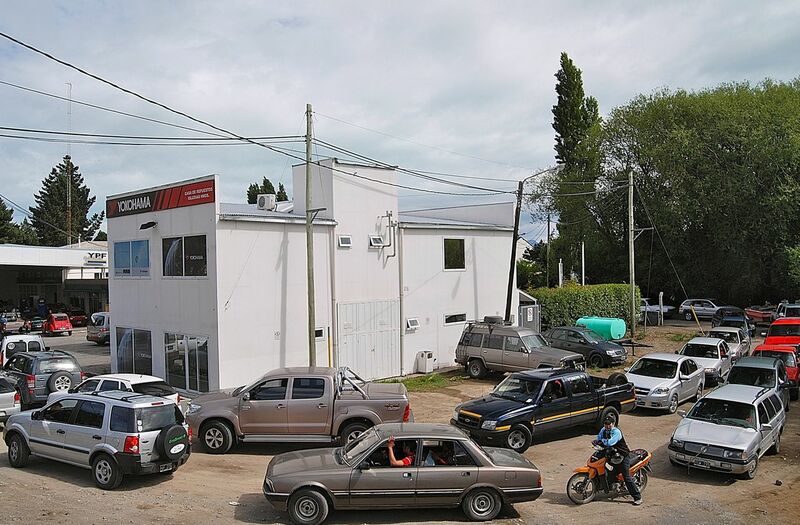 Long lines of automobiles and buses - directed by municipal traffic wardens in the congested streets around the YPF station (pictured below) - have been commonplace even though tankers are arriving everyday. That said, those lines appear to have shortened since I arrived here last Friday. The situation in Chile is returning to normal, and I’ll have more to say about this after Wednesday, when I cross to Puerto Natales. I will add, though, that my cousin’s husband Sebastián Bruna, a guide in El Calafate, worries that winning the faceoff with Chile’s government could make pickets and roadblocks the first resort, rather than the last, the next time there’s any dispute. He also worries that the success of Chile’s pickets could encourage the same on the Argentine side of the line in some future conflict, in a region where cross-border traffic is critical to the tourism sector. Over the past twenty years, I have driven Argentine Patagonia’s legendary Ruta 40 (“La Cuarenta”) about a dozen times, but until this week, I’ve always done so from south to north. Last week, though, I entered the country at Los Antiguos and drove south from the town of Perito Moreno to El Calafate, where I am presently staying with my cousin Elisa Rodríguez (a guide at Parque Nacional Los Glaciares) and her husband Sebastián Bruni (also a guide here and beyond the region). La Cuarenta has changed dramatically over those two decades - when I first drove the route in 1991, with my wife María Laura and our friend Bruce Caplan, we took four days to cover the roughly 600 km (or perhaps I should say the rough 600 km, as it was all rocks and gravel) from El Calafate. We made detours to destinations such as Parque Nacional Perito Moreno and, in the course of the trip, we saw a grand total of three other vehicles. Almost half the route is paved now, and work is proceeding quickly, and not so quickly, almost everywhere else. In the interim, there are washboard detours and one segment near Estancia La Angostura that will continue to provide a taste of the original as La Cuarenta is rerouted east to pass through Gobernador Gregores, which has gasoline and other services, including hotels and restaurants. In fact, despite the increased traffic - I saw hundreds of buses, cars and motorcycles, and a few bicycles en route - there seem to be fewer services on the original route than in past years. 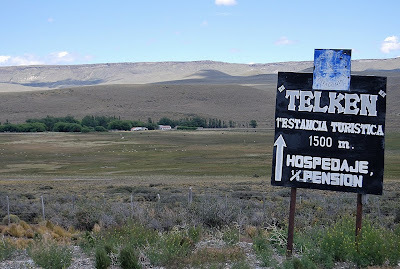 Over the many years I’ve traveled throughout the region, one of the highlights has always been an overnight at Estancia Telken, a poplar-sheltered sheep ranch roughly midway between Perito Moreno and the UNESCO World Heritage Site of Cueva de las Manos. My hosts there have always been Coco and Petty Nauta, descendents of Dutch and New Zealand immigrants respectively, who also welcomed tourists to the ranch - in fact, they even welcomed backpackers and cyclists, for whom they set aside a grassy campground with an enclosed kitchen and hot showers. It was the guests in the main house and adjacent cabañas, though, who got the real family treatment - evening meals were a communal celebration that recalled the days when it would never have occurred to Patagonian ranchers to ask any visitor for payment. Rather, you felt that they simply enjoyed having guests and you felt like their invitee. Unfortunately, as they aged, Coco and Petty finally acknowledged they couldn’t continue the strenuous task of running a ranch, and sold the property two years ago to a family from Comodoro Rivadavia. Still active, the Nautas retain a smaller property just outside Perito Moreno, but they are no longer innkeepers. After two seasons as absentee proprietors, Telken’s purchasers finally decided it should be a simple sheep ranch rather than a roadside inn - one of few along this newly paved segment of La Cuarenta. There are other estancias alongside the highway, but none of them can match Telken’s hospitality, and the sign still standing along the highway is a reminder of what’s been lost. Having originally planned to spend Saturday night in Chile Chico, I finished updating its entry for the new edition of Moon Handbooks Patagonia by late afternoon and decided that, rather than face immigration and customs bureaucracies on Sunday morning, I would cross into Argentina and spend Saturday night in the town of Los Antiguos - best known for January’s Fiesta de la Cereza (Cherry Festival), which I missed by just a few days. As it happened, the Cherry Festival was something of a chaos because the crowds who flocked to town found Banco Santa Cruz’s two ATMs ran out of cash - a topic to which I referred in my previous post. 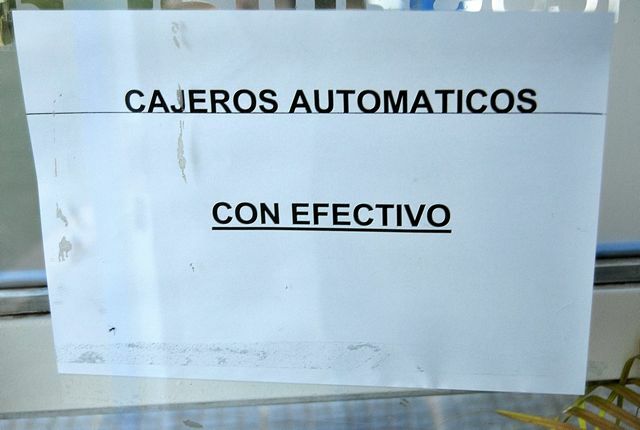 When I arrived, though, the tourist office informed me that the situation had resolved itself and, in fact, the access door to the cash machines bore a window sign that said “Cajeros Automáticos con Efectivo” (Cash Available from ATMs). With that reassurance, I paid my hotel bill and ordered an excellent leg of lamb dinner with the Argentine cash I had obtained in Villa O’Higgins a few days earlier. Confident in my ability to withdraw money, I didn’t even bother to hit the ATM before going to sleep. Perhaps I should have. When I tried the machines Sunday morning, both were out of service and I had spent about a third of the 780 pesos (roughly US$200) I had brought from Chile. Fortunately I was able to purchase gasoline by credit card but, as I contemplated a southbound odyssey on Ruta 40 (“La Cuarenta”), where credit cards are unheard of, I was facing a choice between feeding my face and feeding my internal combustion engine (I could always sleep in my tent instead of a hotel). 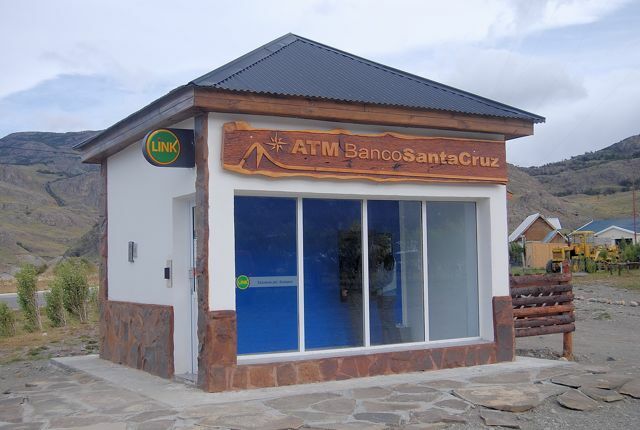 When I got to the town of Perito Moreno, about 60 km east of Los Antiguos on the south shore of Lago Buenos Aires, I didn’t bother visiting the Banco Santa Cruz ATM. Instead, I went to the local branch of Banco de la Nación and, after sliding my debit card into the machine, crossed my fingers that it would be more successful this time. In fact, it coughed up 950 pesos (about US$240); though I’m not a gambler, I threw my fists in the air as if I had won the lottery. Meanwhile, after arriving late yesterday afternoon in El Chaltén, I soon learned the situation has not alleviated here. According to the tourist office, the ATM has once again run out of cash and, though bills are supposedly due to arrive today, one wonders how long they’ll last. In 20 years of coming here, I have never seen so many people - accommodation is hard to find, restaurants are packed with diners lined up outside at 10 p.m., and the newly paved streets are full of pedestrians. Since last week, when Chilean president Sebastián Piñera decreed a 17 percent increase in natural gas prices, the southernmost Chilean region of Magallanes and Tierra del Fuego has been in an uproar. In this cool climate, its capital city of Punta Arenas and the rest of the region rely on natural gas for home heating and, in response, protestors have blocked access routes in and out of the city, and from the Argentine side of Tierra del Fuego to the Chilean side, as well as mainland border crossings to Argentina. 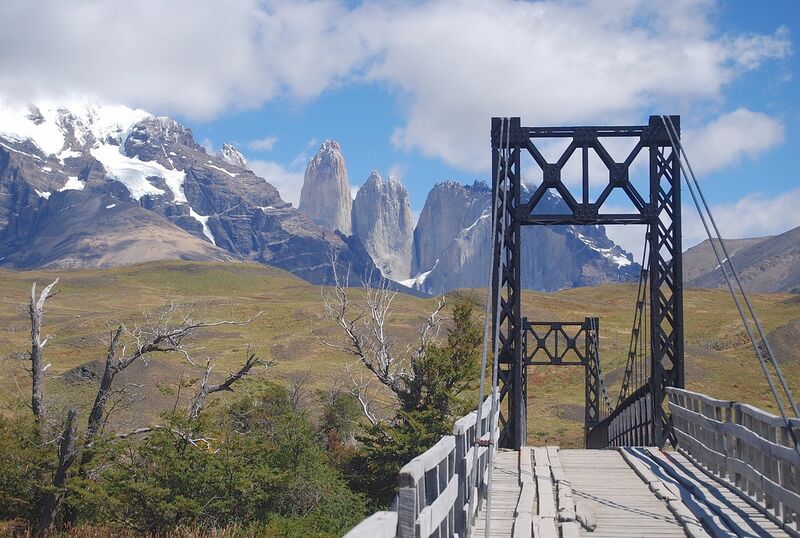 This has meant major problems for tourists in Torres del Paine, who have had trouble getting back to Punta Arenas for their flights home or across the border to El Calafate, and the park has closed for the time being. 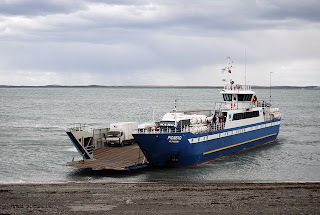 It's also a problem for many Argentines and others wanting to return overland from Ushuaia, on the Argentine side of Tierra del Fuego - there’s no way to do so except through Chile, and the ferries from the island to the mainland (pictured above) have also been interrupted. In a truly ironic gesture, the Argentine government has requested its Chilean counterpart to intervene so that its citizens can return home overland. While I would agree that allowing demonstrators to close an international border is irresponsible, this is exactly what Argentina has ignored for the past several years at the crossing from Gualeguaychú to the Uruguayan city of Fray Bentos. In one sense, the Argentina-Uruguay situation is even worse, as the Argentines abdicated control of who may pass - or not - to the demonstrators. Breaking News, Wednesday morning: As of Tuesday night, the government and the protestors had tentatively settled the dispute, and roadblocks were being dismantled. Everything, including the various border crossings and access to Torres del Paine, should be back to normal very soon, if it isn't already. Today’s entry covers new air services to Rapa Nui (Easter Island), and Argentina’s latest monetary crisis. More than half a century ago, Thor Heyerdahl surmised that the first inhabitants of Easter Island had arrived from present-day Peru, and set off to prove that on his raft Kon-Tiki. He deserves credit for asking big questions, but subsequent archaeological evidence proved that the stubborn Heyerdahl was wrong - in fact, Rapa Nui’s earliest inhabitants crossed the Western Pacific from Polynesia. Contemporary travel from Peru to Easter Island is literally taking off, though, as LAN has instituted twice-weekly flights from Lima to Hanga Roa's Aeropuerto Mataveri (pictured above) - no longer will Rapanuiphiles have to fly three hours farther south to Santiago to catch another five-hour flight to Chile’s iconic volcanic speck in the mid-Pacific. On the face of it, this is a brilliant commercial move - archaeology fanatics fresh from Machu Picchu and other Peruvian sites will have an easy means of seeing the enigmatic stone statues of Rano Raraku and other sites without visiting mainland Chile. The hope, though, is that this will become part of a tourism triangle from Peru to Easter Island to Santiago (which has many more flights to and from the remote island) and elsewhere in Chile. It also provides a possible way to avoid Chile’s unfortunate “reciprocity fee,” which is collected only at Santiago’s Aeropuerto Internacional Arturo Moreno Benítez (SCL). Lima to Hanga Roa passengers should not have to pay the fee there, and the segment from Hanga Roa to SCL is a domestic flight (though it usually arrives at the international terminal). No, it’s not the country’s foreign debt. Astonishingly, for a country that spent much of the 1980s printing money enough to fuel an inflation that often reached 50 percent per month, there is such a shortage of banknotes that the government has had to turn to Brazil to print three billion pesos’ worth of 100-peso notes. 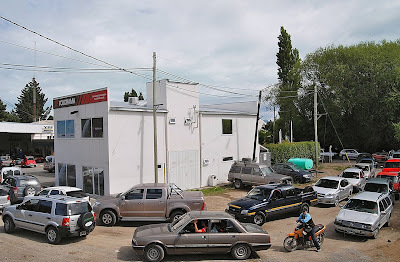 In the meantime, in many parts of the country, there is simply no cash in the ATMs - according to an overland traveler with whom I spoke in Villa O’Higgins last night, many arrivals in El Chaltén (whose ATM appears in the photo below) have no cash whatsoever, and their plastic does them little good as credit cards are still a little uncommon there. For my part, I will be entering Argentina in a couple days and, as an emergency measure, I changed some US dollars into Argentine pesos thanks to Jorge Salgado, the Spanish owner of the new El Mosco B&B, hostel and campground in Villa O’Higgins. I will be crossing from Chile Chico to Los Antiguos and Perito Moreno, then heading south to El Chaltén, and don’t want to be caught without cash - especially when there are no credit card gasoline options along southbound Ruta 40. For the moment, at least, all Argentina-bound travelers should carry some US cash. For a long time, the differential rates for national park admission in Chile have been a sore point, and a cause for debate within the Corporación Nacional Forestal itself. 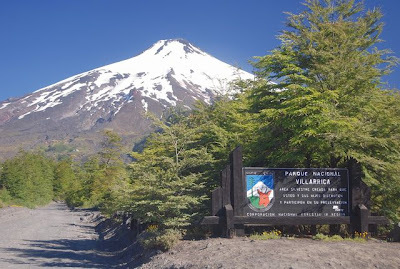 More than once, in fact, Conaf officials of long (and not so long) acquaintance have asked me what I thought of the policy by which foreigners sometimes pay twice as much as Chileans to visit protected areas such as Parque Nacional Villarrica (pictured here). This policy appears unlikely to change in the short run, but there is an alternative bright spot. 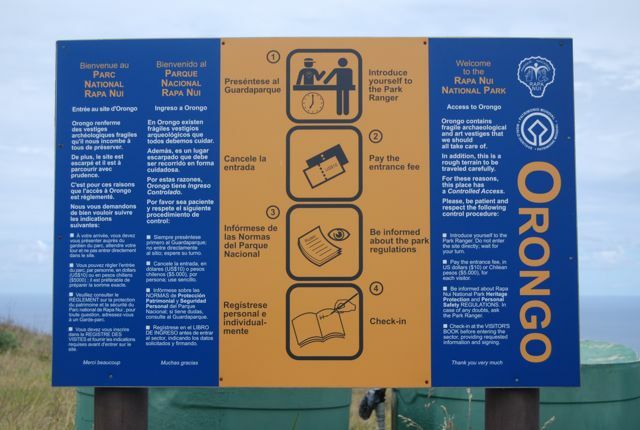 At present, Conaf is instituting a system of individual and family passes, for both Chileans and foreigners, that will permit admission to most parks for one calendar year from the date of purchase. The individual pass will cost 10,000 pesos (about US$20), while the latter (to include up to four children under age 18) will cost 30,000 pesos (about US$60). 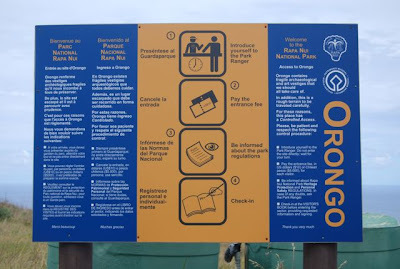 For individuals of families visiting more than three parks on their holidays, this is well worth looking into. It’s not quite clear, though, when the passes will go on sale - when I visited Dennis Aldridge (an Anglo-Chilean) of Conaf’s Patrimonio Silvestre (Wildlands Heritage) desk in Coyhaique a few days ago, he told me they had not yet arrived. There’s another disappointing glitch as well - the passes will not be valid for Easter Island’s Parque Nacional Rapa Nui, nor for Southern Patagonia’s Parque Nacional Torres del Paine. These are two of the most popular parks, with expensive admission fees, for foreign visitors. It would also be better if the passes were more widely available than at Conaf offices and park entrances, where they could run out. The obvious choice would be permanent tourist information sites, such as Sernatur offices in Santiago and regional capitals, and municipal offices in major tourist destinations (such as Pucón and Puerto Varas). Meanwhile, if proposed legislation advances, a new national park service will supersede Conaf - like the US Forest Service, Conaf is really more oriented toward commercial forestry than wildlands conservation. Due to split off from Conaf, a new Servicio de Áreas Protegidas y Biodiversidad (Protected Areas and Biodiversity Service) will focus more closely with parks and environmental conservation. This may mean fewer internal arguments over conservation policy, but rather more public arguments as the two agencies jockey for bureaucratic turf. Chile's Least Visited National Park? 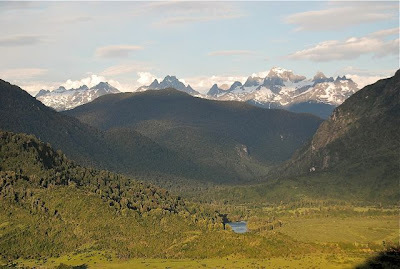 Southwest of the regional capital of Coyhaique, Parque Nacional Laguna San Rafael is one of Chile’s largest national parks, where the ice from the Campo de Hielo Norte, the Northern Patagonian Icefield, reaches the sea. 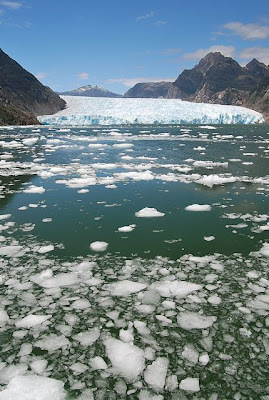 I have viewed the jagged seracs of the park’s namesake glacier - the world’s lowest-latitude tidewater glacier - on three separate trips, but I have never actually entered the park. 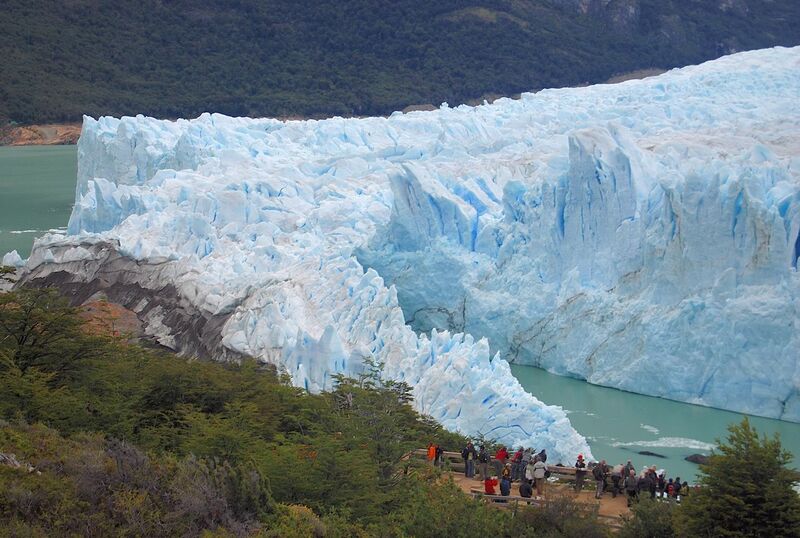 In fact, despite the fact that thousands of visitors view the glacier up close and personal every year, only a handful of them ever enter the park - in 2009, the last year for which complete statistics are available, only 158 persons (82 Chileans and 76 foreigners) actually set foot in it. 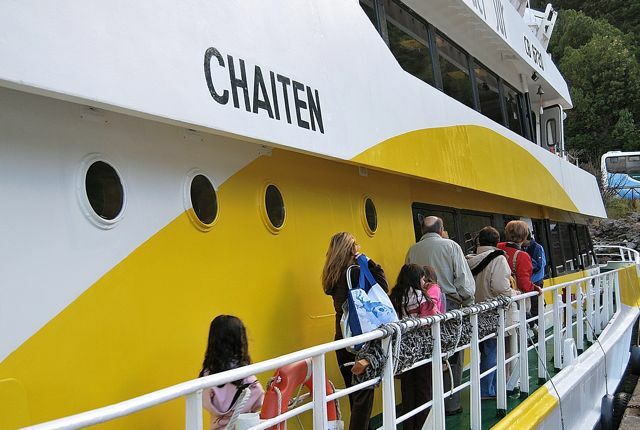 That’s because the jurisdiction of the Corporación Nacional Forestal (Conaf), which manages the park, ends at water’s edge, and almost everybody arrives on catamarans, cruise ships and ferries that quickly turn around and head back to Puerto Chacabuco, the port from which they sailed. That was my experience again on Wednesday, when Catamaranes del Sur’s high-speed Chaitén sailed from Chacabuco at 8 a.m., arriving at the glacier around 1 p.m. after a couple brief stops to view sea lion colonies en route. Over the next couple hours, the crew shuttled the passengers on Zodiacs along the glacier’s face - not too close, to avoid the crash of melting towers of ice and the waves they create - on a magnificent day that yielded the best views I’ve ever had of the advancing river of ice and its surrounding peaks. In the course of my Chilean travels, I have also taken the Navimag ferry from Puerto Montt to Puerto Natales at least half a dozen times, and I never cease to marvel that, in a world of six billion people, such an enormous area could be almost unpopulated - human settlements, or any sign of population, are virtually absent in an area that resembles the Alaska Panhandle. Verdant forests rise from the sea to mountains bearing the last of the winter snow, among other peaks of perpetual snow and ice, but they remain largely nameless, to me at least. In reality, except for the handful who earn their livelihood at sea, this is still the nearly trackless wilderness it was when British naval officer John Byron - grandfather of the famous poet Lord Byron - was shipwrecked here in the 18th century, and when the HMS Beagle, with Darwin and FitzRoy aboard, anchored at Laguna San Rafael in 1835. On one level, the forested hillsides and islands of archipelagic Chile differ little from the barren wastes of the Atacama desert - there is a verdant monotony to them. Yet in the Atacama the evidence of human habitation and activity is present everywhere, while in the lush south it's simply overgrown, if indeed it ever existed. There is no simple way to orient yourself, other than by the cardinal directions - in general, you’re going north or south. While seeing Laguna San Rafael other than by sea has been difficult, that’s starting to change. A new operator, affiliated with Coyhaique’s Condor Explorer and Puerto Río Tranquilo’s El Puesto, is taking hikers by sea to the park for day trips, and for one- and two-night packages with tent camping. It’s not cheap - about US$180 for the day trip and US$300 for the overnight, not counting transportation to the end of the Río Exploradores valley road - but the price compares favorably to the catamaran and cruise ship excursions. Today’s entry deals with various topics related either directly or peripherally with Chile’s Carretera Austral, the reach of the country’s health care system, an earthquake that briefly made headlines, and the ongoing relationship between Chile and California. In northern Chilean Patagonia, the old year ended and the new one began with a heat wave in which temperatures in normally mild Futaleufú soared into the upper 80s or low 90s Fahrenheit (around 30 to 35 degrees Celsius). After a sweaty but rewarding New Year’s Day hike on the outskirts of La Junta (which yielded the above photo of the Cordón Barros Arana), and a Sunday excursion on the new road to Raúl Marín Balmaceda, I arrived yesterday afternoon in the hamlet of Puerto Puyuhuapi, settled in the mid-1930s by Sudeten Germans. Unfortunately, my exertions had contributed to a case of sniffles that developed into a full-blown cold. Among my meds, I had no antihistamines to attack the symptoms in a town that has no pharmacy. 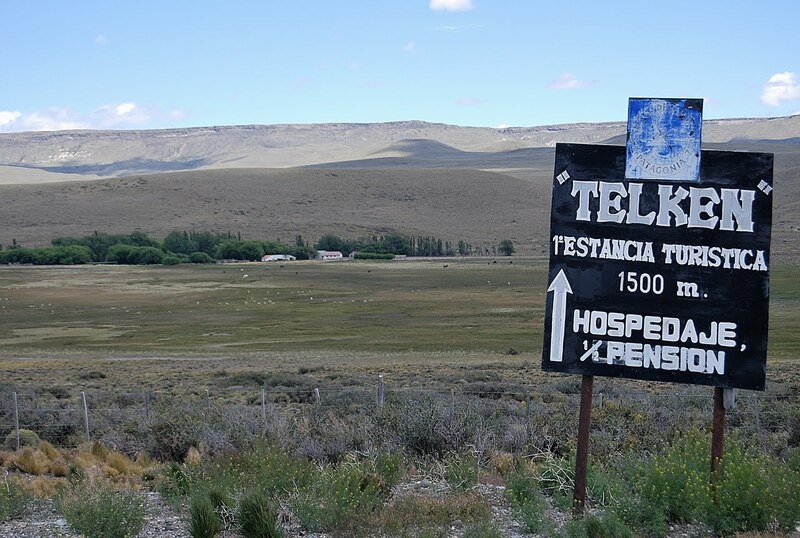 Fortunately, almost every Chilean village of any size has a posta rural, a clinic that attends to the needs of locals who can’t get to a doctor. On request, they provided me a small packet of chlorphenamine tablets that has kept things under control. The price for this service: free of charge. On Sunday night at 8:20 p.m., Chile again headlines for a significant earthquake fairly close to the epicenter of February’s massive quake. Originally reported as a 7.1 on the Richter scale, the new quake had its epicenter in the Pacific Ocean northwest of the city of Temuco; by some accounts it’s since been downgraded to a 6.9, and there are no reports of deaths or even serious property damage, and there has been no tsunami. Nevertheless, it apparently caused some people to take shelter on high ground, and others abandoned their vacations in Pucón, the resort city nearest the epicenter, clogging the tollbooths on the highway to Santiago. Fortunately, despite the initial reports, there’s simply not much of a story here - in fact, it only briefly appeared on the home page of the Santiago daily El Mercurio before being crowded out by a story about the government’s readiness to intervene in the exchange rate to depress the soaring Chilean peso. For the tourism industry, which has much of its income in dollars and euros but has to pay its costs in pesos, this is a positive development. It would also attract more visitors by making travel here cheaper. This morning the dollar has gained nearly 20 pesos, from 465 yesterday to 484 at this hour. Hasta la Vista, Baby, ¡de Nuevo! As a Californian, I did not vote for Arnold Schwarzenegger for governor, and I am not sorry to see him leave office even if he may not have been the unmitigated disaster that most of fellow Golden State citizens now consider him (when Argentines and Chileans asked me my opinion of Arnold, I would tell them that “At least he speaks better English than George W. Bush”). I am particularly disappointed, though in his failure to live up to one promise - in mid-2008, when then Chilean president Michelle Bachelet (who also speaks better English than Bush) visited California, Schwarzenegger pledged to visit Chile and has not yet done so. Perhaps, with free time after leaving the governorship, he will do so now.